Gangtok: Foreign visitors to Sikkim will soon be allowed access to Gurudongmar Lake and other enchanting places in North Sikkim, which have been out of bounds for them so far in a move that is expected to lead to a significant rise in the number of international tourists visiting the Himalayan state. The proposed lifting of restriction on foreign tourists to the sensitive border destinations comes after the Union home and defence ministries gave their approvals. "We have received a notification (lifting the restriction) from the Centre. We will be holding a meeting with the state home department on June 6 in this regard, and come out with an official notification," said C. P. Dhakal, the secretary of the state tourism department. Foreigners need to obtain travel documents like Restricted Area Permit (RAP) and Protected Area Permit (PAP) to visit Sikkim. The state is considered very sensitive from the security perspective because it is surrounded by China, Nepal and Bhutan. Foreigners are not allowed beyond Thangu in North Sikkim. 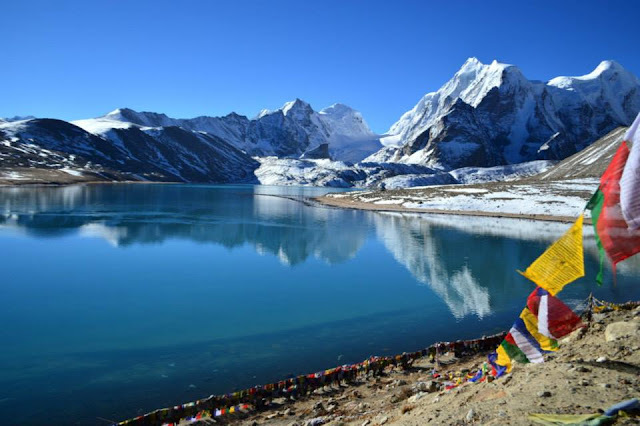 With the lifting of the restrictions, they will be allowed to go all the way to Gurudongmar Lake situated at a height of 17,100ft and a popular with domestic tourists. Another popular site for domestic tourists, Nathu-la pass in East Sikkim will, however, continue to remain out of bounds for foreigners. Nearly 50,000 foreigners visited Sikkim last year. The footfall of domestic tourists during the same period was a massive 14 lakh. The state is expecting to host about 20 lakh tourists this year. "The lifting of restriction on foreigners will definitely lead to an increase in the footfall in the autumn and winter seasons. The overall tourist arrival will also see a massive increase because there is no disturbance in the neighbouring Darjeeling hill," said an officer of the tourism department. With peace prevailing in the Darjeeling hills, and the warming of relations between Sikkim and Bengal, the tourism boom will benefit both the states since Sikkim and north Bengal are considered an integrated circuit. "There is also a massive rush of tourists to Darjeeling and the Dooars this season. Fingers crossed, this should be replicated in the second half of the season as well," said a travel agent. Given the massive arrival of tourists, there have been many complaints of overcharging by taxis and hotels, and unfair business practices by travel agencies. The tourism secretary warned that action would be taken against those harassing tourists. "We have been getting complaints about overcharging by taxis and hotels. We held a meeting with various stakeholders, including the police, in this regard. We all agreed that action would have to be taken against those who harass the tourists. We all must act responsibly in order to sustain tourism," said Dhakal. A tourism official said some travels agencies had been cheating tourists by promising to put them up at good hotels, but dumping them in ordinary hotels here. "We have received a number of such complaints. Some of the travel agencies based outside Sikkim are the main culprits. We would advise tourists coming to Sikkim to look up our official website and get their bookings done by authorised travel agencies. We are helpless in acting against agencies based outside, but if those registered with us does any such thing, we can haul them up," said the official. Foreign visitors to Sikkim will soon be allowed access to Gurudongmar Lake and other enchanting places in North Sikkim, which have been out of bounds for them so far in a move that is expected to lead to a significant rise in the number of international tourists visiting the Himalayan state.